This is the second report in the Teaching and Learning Research Initiative (TLRI) Project Plus series. 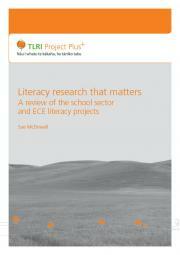 It looks at the 18 literacy-related projects in the early childhood and schools sector funded by the TLRI between 2003 and 2014. It considers what the community of researchers see as important in literacy teaching and learning, the problems to be tackled, the approaches taken and the new knowledge that has been built. The intention is to celebrate what has been done well in the field of literacy research, to identify areas that might have been overlooked or underserved and to consider what should come next.